Wash asparagus and break off the tough ends. Reserve a few tips for garnish. Cut the potato so it will fit through the processor's feed tube. In the Cuisinart with the "S" blade, process the shallots and garlic. Remove. Insert the 4mm slicing blade, and feed the asparagus and the potato through the feed tube. Melt the butter in a large saucepan. Briefly saute the shallot/garlic mixture over medium heat. Add the asparagus/potato mixture and the stock. Bring to a boil, then reduce heat and simmer about 15 minutes. Strain the solids and reserve the liquid. Using the "S" blade, puree the solids. Add about 1 cup of the reserved liquid while the machine is running and process until smooth. Combine the puree and the remaining liquid in a clean saucepan and reheat. Season with ground thyme, salt, white pepper and lemon juice. 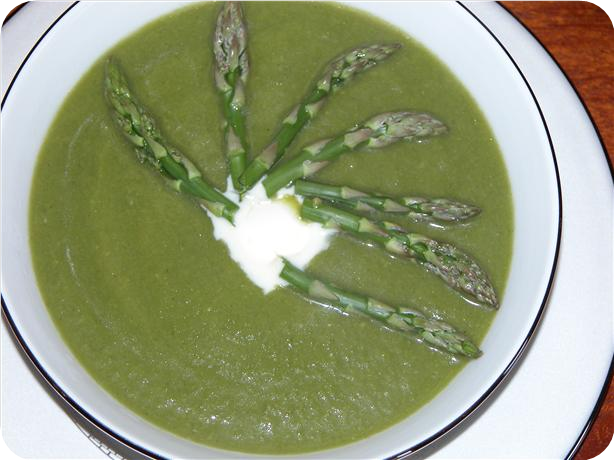 Garnish with reserved asparagus tips and a teaspoon of low fat sour cream.